Students in the Program for Excellence in Selling took home a first place win for the second year in a row at the 2012 National Collegiate Sales Competition. Competitors Grace Moceri (center left) and Sonya Brooks (center right) took home first and second place, sweeping the competition for the first time in University of Houston history, with Bryan Hentges and Markee Johnson as alternates. A team of four students from the Program for Excellence in Selling at the University of Houston C. T. Bauer College of Business placed first in the U.S. for the second time on March 5 at the National Collegiate Sales Competition held at Kennesaw State University. Competitors Grace Moceri, who placed first, and Sonya Brooks, who placed second, together claimed the overall number one spot for the University of Houston for the second year in a row with team alternates Bryan Hentges and Markee Johnson. This is also the first time that a University of Houston has swept the competition and for a student to receive first place overall. The competition required the students to prepare a sales presentation for a mock meeting with a buyer lasting 20 minutes, as they were recorded and graded by a judging panel on criteria such as needs identification, approach and communication skills. Receiving a championship two years in a row only adds to the Program for Excellence in Selling and Bauer’s outstanding reputation, said Randy Webb, director of the Program for Excellence in Selling. “The second championship trophy in that many years is a true testament to the education being taught in this program and we are very proud of our students for this outstanding accomplishment,” Webb added. This is the second year in a row that the Program for Excellence in Selling has brought home a first place win. 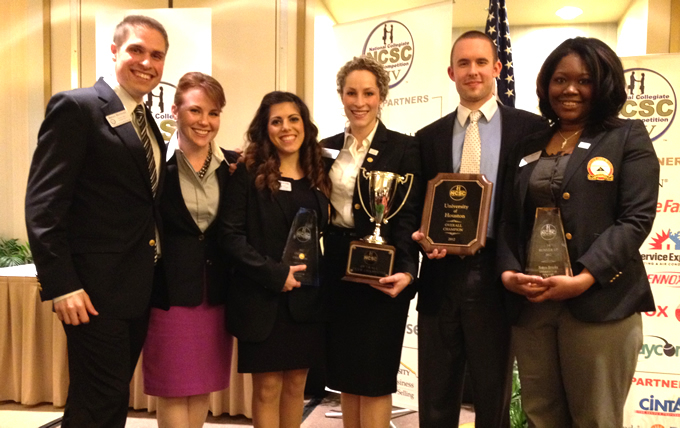 Last year, Taylor Herbert and Rebekah Elliot brought home the first place win from the 2011 National Collegeiate Sales Competition, with Jozette Bionat and Adrian Sese serving as team alternates. 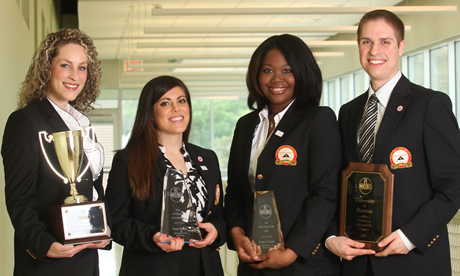 Students in the Program for Excellence in Selling took home a first place win for the second year in a row at the 2012 National Collegiate Sales Competition. Competitors Grace Moceri (center) and Sonya Brooks (end) took home first and second place, sweeping the competition for the first time in University of Houston history, with Bryan Hentges, and Markee Johnson as alternates. I am so proud of the Bauer College and the Program for Excellence in Selling! Way to go Grace and Sonya! I’m actually an alumni from UH and now I’m an EMBA student! It makes me very proud to know how well my school is doing and to know that your program in selling works. You must feel pretty good about yourselves as well, no? P.S. I would love to take that course sometime! can somebody tell me about the sale contest in detail? I’m very curious about this competition!! !